Ottawa Post Office, 1890s. The War Memorial is now located here. The National Capital Region may now be the seat of the federal government, but it once was a sleepy logging territory and has had a rough and tumble history. Once Algonquin territory, the first European settlements in the Ottawa area occurred in the early 1800s. After the War of 1812, Colonel By began building the Rideau Canal as a defense and major waterway. Tensions between Irish and French settlers mounted and riots occurred in the 1830s and 40s. In 1855, the town was renamed Ottawa instead of its former name, Bytown. Queen Victoria chose it for the capital of Canada two years later. A massive fire destroyed 2/3’s of Hull and about 1/5 of Ottawa in 1900 and another fire destroyed the Centre Block of the newly built Parliament Buildings in 1916. 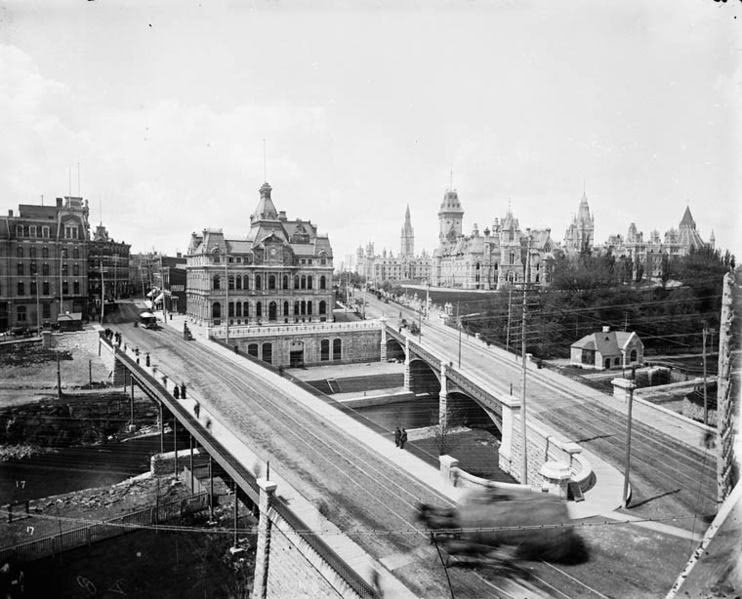 The history of Ottawa is fascinating, and whether a long-time resident or someone new to the city, we think you’ll find the links we suggest here to be of great interest. You’ll see photos of now-demolished buildings, learn more about the growth of the city, find out what areas of Ottawa may be haunted, and can research further at the City of Ottawa Archives or the Library and Archives Canada.